If you read my last post, Vegan Keto: What I Eat In A Day, you probably saw me mention Vega protein shakes. They are my go-to for breakfast, lunch, and even dinner when my family decides it's a free-for-all. I love Vega products and purchase the Vega Essentials Vanilla protein powder through my Amazon Prime account or at my local Target store. This vanilla keto protein shake is a staple that I keep in rotation throughout the week to keep my macros in check, my tummy full, and my energy on point! Because this is a base recipe, you can add whatever keto fixin's you want! You probably noticed in the picture above that my shake is sending you some serious green smoothie vibes. That's because I threw in a scoop of Essential 10 Supergreens powder by Designer Proteins for a boost of fiber and micronutrients! 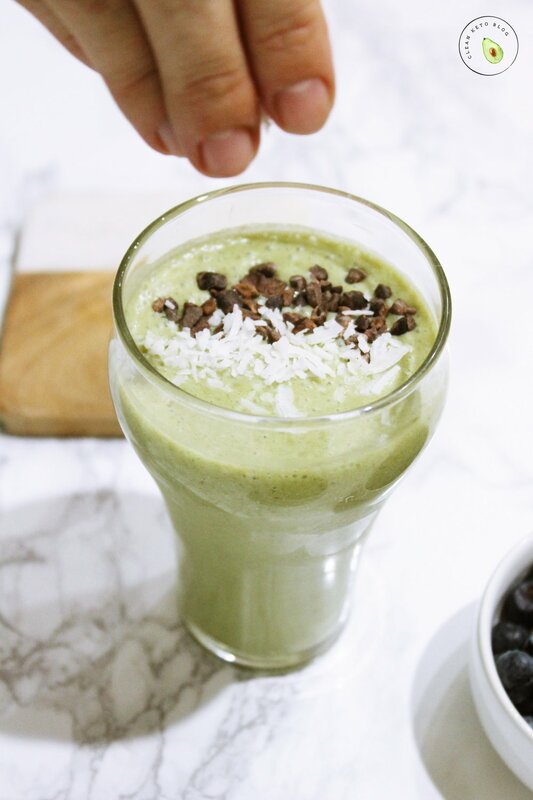 Topped with unsweetened shredded coconut and cocao nibs and you have yourself a delicious and nutritious shake that clocks in at less than 3g net carbs. One thing I love since starting on my keto journey is that I'm not scared of fats anymore, which is why I'm not worried adding MCT oil, hemp hearts, or even nut butters to my shake. I want those delicous fats and calories! The great thing about this base recipe is that it starts off at ZERO net carbs. That means you have some wiggle room to include some delicious keto-friendly add-ins, like nut butters and berries. Even after my MCT oil and cold brew coffee, I'm still at zero net carbs. This helps me save my carbs for dinner! Want to know why? Check out my post Vegan Keto: What I Eat In A Day! What do you put in your vegan keto shake? Leave me a comment! Disclosure: Please note that some of the links above are affiliate links, and at no additional cost to you, I will earn a commission if you decide to make a purchase after clicking through the link. Please understand that I have tried all of the products I link, and I recommend them because they are helpful and useful, not because of the small commissions I make if you decide to buy something through my links. Please do not spend any money on these products unless you feel you need them or that they will help you achieve your goals! JOIN THE CLEAN KETO FAMILY! I promise not to spam you or share your information with others.